Glamping For Christmas - Inspired Camping. We were sent a copy of the new Glamping book from Mary Jane Butters and having enjoyed the inspirations throughout we think it could make a perfect gift for anyone wanting to go glamping for Christmas. From back yard glamping to safety, entertainment, food and housekeeping, to trailer shopping and restoration, it’s stuffed full of information ideal for anyone wanting a guide on how to get their own glamping experience just right. Glamping, or glamour camping… is about the juxtaposition of rugged and really pretty, grit and glam, diesel and absolute daring. 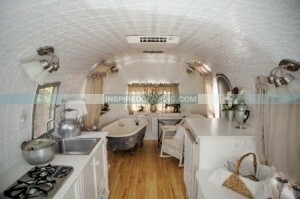 We also like how the book focusses both on the glamorous side of glamping as well as the practical and helpful. There are very useful sections on how to make your own camp table, changing the oil in an engine and tips on how to reverse your trailer or caravan to impress everyone at the campsite. This book isn’t for those who like the simple and traditional side of camping, but instead it’s for those who like the more comfortable side of getting outdoors. It’s also a book focussed very much on the American market as there are many references to products and advice that are only relevant to the U.S. However, there are still many treasures throughout this book to be gathered by everyone else no matter where in the world they are based. Mary Jane Butters is an organic farmer from Idaho, USA, selling organic food from her farm. She is also a book author, publisher and creator of projects to employ rural women in America by making and selling crafts. She worked for Emil Keck in the wilderness for the Forest Service. He was the husband of a living legend Penny Keck, and astonishingly Mary Jane once walked 27 miles with her daughter on her back just so she could meet her mentor. Now that’s determination for you! 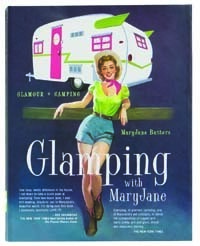 So you certainly don’t need to question Mary Jane’s credentials when it comes to writing this type of book, as she’s braved all kinds of camping experiences including staying all year round under canvas surrounded by five feet of snow and everything else Mother Nature had to throw at her. This is a hardback book ideal for the coffee table and girlie gatherings with friends. It’s packed full of glamping inspirations too numerous to mention, that all come from a woman who clearly knows her traditional wilderness camping and glamping skills inside out! The author has a list of impressive successes under her belt and is clearly a pioneer for women. If someone in your family is seriously into glamping up their camping experiences then this is the book for them as it would make a perfect gift this Christmas. The book focusses on the American market and what you need to know to glamp in the U.S. with many speciality items and information not relevant anywhere else. However, as long as you are happy to do your own research for where you live then there’s no reason why you won’t be able to find alternatives. The book can be bought at a reduced price through our online store. This is very definitely a coffee table book that focusses on the girlie side of glamping and would make an ideal Christmas present for anyone wanting to hone their glamping skills so they can get outside in style. So if you fancy going glamping for Christmas then this is the book for you to make sure you get your own stylish experience just right… 4 stars. ***** We’d sell our Granny and cut off our right arm to get one of these! **** This is great and comes highly recommended from us. *** We recommended this but there are a few imperfections. ** Not ready to recommend this yet, but it’s getting there. * We wouldn’t recommend this to a sleeping goat! If you have a product you would like us to honestly review we’d love to hear from you so please say hello. An example of a camping product recently reviewed by us is the Biolite Stove.